An upright ornamental shrub 9-15' x 6-15' with narrow grey green leaves and often suckers from the roots to form a copse. It has yellow scented flowers in winter-spring. Prefers full sun or partial shade and well-drained soils. Excellent windbreak or screen. 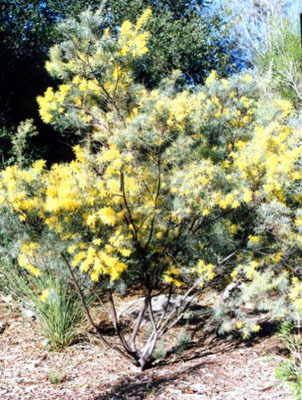 Grows well inland and on the coast and tolerates extended wet periods.